We have covered various tools for creating GIF animations. This post is also about a similar kind of tool, but this GIF creator tool creates GIF from Instagram images. It basically asks you to enter the username of any Instagram user and then it creates GIF animation by using popular photos of that Instagram user. This tool is called Instagfy. Try this tool and create awesome GIF animated slideshow of photos. Not just GIF creation, this tool also lets download or share the GIF with friends on different social networks. You can also export GIF in other formats like MP4 and WebM file. Use of this tool is very simple. 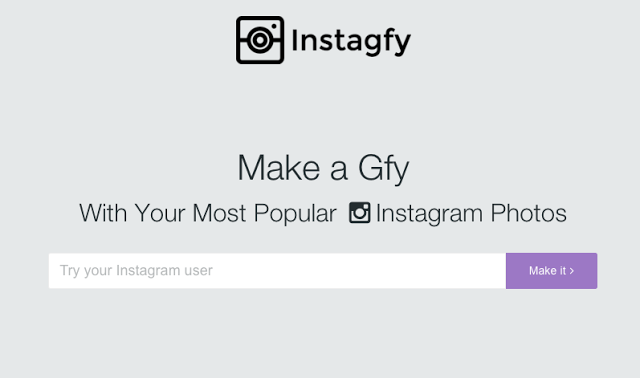 Just visit the Instagy website and you will see a text box asking for username. Enter the username and click on ‘Make it’ button. It will take few seconds in processing and then product a GIF image. It also adds its watermark in the output GIF. At the top of the GIF, you will also see the social sharing buttons to share the image with friends. Last option lets you download this GIF. I tested this tool with my Instagram account and found a good output. See the image attached below. This tool is interesting if you want to create a slide show of images in GIF format. You do not need to download or save images from Instagram to use. Just use this tool and get a good GIF. Try this tool and share your view with us via comments.